I recently got a Motorola Droid X smartphone. I cannot tell you how much I am completely in love with the Android phone! But then, I really dig gadgets & electronics in general, so it’s not all that surprising. Before this, I had an iPhone 3.0. For the 2 years I had it, I absolutely loved that phone too! When the Android phones first came out, I knew from the get-go that I wanted to wait until the 2nd generation phones came out before I got one. I don’t like to be the guinea pig on many 1st generation things. Not when it comes to electronics. My husband Jim, on the other hand, was one of the first to own the Droid Original. It had a slide-out keyboard which was another reason I didn’t want to jump on board just yet. Touchscreen is fine for me, so I didn’t want the added bulk for a keyboard I’d never use. About a year later, he upgraded to the Droid X and I became even more intrigued by all that the Android phone can do that my iPhone couldn’t do. An Android phone is more like an actual computer, whereas the iPhone is more like a portal (or a way to view data in certain programs). Android phones use a Google-based operating system, so they work seamlessly with all of the Google programs that I already use on a daily basis. The Android phone is much faster than the iPhone and it has a larger screen (which means the touchscreen keyboard keys are bigger, pages are easier to read, therefore the overall experience is much better). My “frugal self” clung to the fact that my iPhone managed to do the basic things that I wanted and needed. But my “gadget-friendly self” knew that an Android phone would do those things (and more) even better. Still, I stuck with the iPhone a little longer. It wasn’t until my battery stopped holding a charge and I had seen how happy Jim and his friends were with their Droids that I became really serious about finding an Android phone that I liked. I wasn’t married to any one carrier. It wasn’t a big deal when I was on AT&T that first year when Jim was on Verizon, so it wouldn’t be a big deal for me to be on Sprint now while he’s on Verizon either. 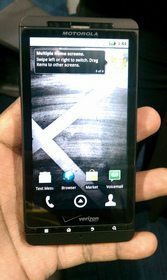 In the end, I settled on the Droid X; so we’re both with Verizon now. In case you’re wondering, I always had near flawless coverage from AT&T for the 10+ years that I was with them. After Jim made the switch from iPhone (AT&T) to Droid (Verizon) a year ago, his reception and coverage were just as good (if not better in other states when he’s traveling) as AT&T’s. So I knew I’d probably be happy no matter which carrier I chose. For the record, Verizon coverage in some states, or some parts of states (like Peru, Indiana where my family lives) is NOT good. It just so happens that Verizon’s coverage where we live (Nashville, TN) is great. I’m a super-organized person, and I like things that are practical, time-saving, money-saving, and simple. For me, the Droid X fit the bill. Plus, I really like the way you can completely customize an Android phone right out of the box. I don’t want to use a phone the way someone else thinks that I should use it. Instead, I want the freedom to use my phone in all the ways that I want to use it. Here’s the way I look at iPhone vs Android in terms of options and capabilities. In my opinion, the iPhone is a dummied-down version of a smartphone — in much the same way that AOL is a dummied down version of the Internet. All the basics are there. You can do just about anything you “need” to do on a phone. But the iPhone is set up as if Apple knows what’s best for you and how they think you should view things and do things on your smartphone. Plus, you’re limited in what you can eventually do with an iPhone — not just in terms of the types of apps that come installed with the phone, but more in terms of how “open” the operating system itself is and how much you can customize it to best meet your needs. One good example is tethering (being able to use your phone’s Internet service on your laptop computer without having to tap into random WiFi hotspots). Tethering is not allowed on the iPhone 3.0, and not without monthly fees with the iPhone 4.0. With the Android phone, there’s a free app (PDA Net) that makes tethering a cinch. For the 2 years that I had my iPhone, it did everything I could want a phone to do, it just did it in the most basic ways. In my opinion, saving things, viewing things, and jumping to other things could have been easier (more customizable). When I finally got my Droid X, this became even more evident. The Android operating system is completely customizable, and you can do most (but not all) things in fewer steps than it takes to achieve the same thing on an iPhone. The iPhone is absolutely great for people who don’t want to spend a lot of time “learning” a new gadget. There is virtually no learning curve. On the other hand, the Android phone is better for those who want a wider array of choices and options with their smartphone. Loving the Droid X more and more each day. MUCH better than the iPhone 3.0 (faster, more customization opportunities, voice directions/gps/maps/places are to DIE for). Still haven’t downloaded any apps yet & loving it right out of the box. To be fair, I’ve done a fair amount of research on the Droid X, and it’s not a perfect and flawless phone. Lots and lots of people have had issues — ranging from minor to major — as I have (see below). But this is pretty common with all carriers and all phones. Fortunately, the Android community is very active and helpful (much like the iPhone community), so it’s easy to find quick fixes and reassurance that you’re not alone with whatever problem you’re having. Unfortunately, there’s not always an easy fix. #1 Believe it or not, I practically had to start over with 3 Droid X phones in the first 11 days after I made the switch from my iPhone. The first time, the phone and email permanently froze after 2 days of use and wouldn’t respond to anything. The folks at Verizon were stumped, so they gave me a new Droid X. Then, about a week later, I had to re-set the phone back to its original state in order to get it working properly again. I took it back to the folks at Verizon, in case they knew of a workaround for the problem I was experiencing (Gmail, Google Calendar, and Google Contacts were not syncing back and forth between my phone and my computer). But they didn’t. They said the phone simply needed to be re-set. Resetting your phone is definitely not fun after you’ve spent so much time syncing the phone with all of your accounts (Gmail, Facebook, Twitter, etc.) not to mention all of the widgets and apps that you had customized to your liking, and then taking the time to get all of the phone’s screens back to the way you like them. Having to go back to Square One and set up all my apps & configurations again wasn’t fun. BUT… I still LOVE the Droid X. Weird huh? #2 Due to its size (super-large screen; plus it’s very tall from top to bottom), I was concerned that the Droid X would primarily be a 2-handed phone. Meaning: you need to have both hands free at all times in order to utilize this phone to its fullest. I had heard that it’s not as easy to do things one-handedly, as with most other smartphones. I didn’t find this to be true. But… I have larger hands (and longer fingers) than most females. They match my 5’9″ height. As I said, I really liked my iPhone when I had it! But, in the end, I always knew that the Droid could do more. And it does. What that “more” is is kind of hard to define though. For me, it’s actually a lot of very little things that all add up to “more” in favor of the Droid. The notifications (“You have an email/text/voicemail/etc”) are much better on the Droid X. The Maps and Places and GPS voice navigation programs on the Droid X completely eliminate the need for a standalone GPS unit. This alone makes the phone worth it to me. You can have several programs open at once on an Android phone. On an iPhone, you have to manually close out of a program in order to open another one (except for the iPod/MP3 player, which could run simultaneously with other programs). You have 24 hours to request a refund for any app purchased from the Android Marketplace that you don’t like. This is not an option with the Apple Store or on iTunes. Android apps can be set to automatically update on the Droid, which is something that is seriously lacking on the iPhone. I never liked having to manually log into iTunes or the App Store to see if there were updates for any of my iPhone apps. Plus, you don’t have to download a program like iTunes onto your desktop computer just to keep your Android operating system up-to-date. iTunes is a space-hog, memory-hog, and it frequently needs updating — which is a very slow process. This last one I haven’t even used yet, but I think it’s pretty cool that you can send any caller immediately to voicemail. Plus, you can completely block calls so you don’t even see them if you want! In the end, it’s lots of little things like that which make the Android phone really unique and highly customizable. One minor thing that I found lacking with the Droid X (it’s still early, I’m sure I’ll find more) is the fact that you can’t take screenshots of your Droid without rooting your phone and downloading 3 pieces of software. With the iPhone, you can simply press the Power button and the Home button at the same time to capture a photo of one of your screens. me of the deeper configuration settings screens. Another thing the iPhone does better is Visual Voicemail. This was almost a deal-breaker for me, because I didn’t want to have to call a separate number to check my voicemail each time. The iPhone has Visual Voicemail built-in. The Droid X does not. Fortunately, there’s an app for that! The Google Voice app gives you Visual Voicemail and more (even free texting if you don’t have an unlimited data plan). All of those things are synced perfectly for me on my Droid X! That’s the best thing about using Google products — whether you have a smartphone or not. You’re able to access your stuff from any computer (or smart phone) at any time. There are no extra logins or programs or steps required to do so. You have access to your stuff 24/7 wherever you are since all of your Google data is stored (securely and privately) “in the cloud”. Only you can see it (or access it), unless you decide to share things with others on a case-by-case basis. Plus all of Google’s products are… FREE! #1 I would encourage you to at least try to use the Swype feature with your keyboard, rather than typing in each individual letter one by one all the time. There’s a tutorial that makes it quick and easy to “see” how it’s done. My best tip: When you start Swyping, do NOT look at each word to see if the Droid got it right. (It usually does.) Instead, wait until you’ve completed your entire message to check each of the words before you hit Send. You will begin to see patterns with the type of words it usually doesn’t get right — like very unique words and names. Swype is a definite time-saver for me, but I didn’t think it would be at first. #2 Yes, there are fewer apps in the Android Marketplace than there are in the Apple Store, but have no fear, most of the “major ones” are there. Plus, developers are rapidly adding more and more Android apps each day! My best tip: Since the Android Marketplace is open to any and all developers (which is a good thing that the Android operating system is open source, rather than proprietary as the iPhone’s is), be sure to read through the comments before downloading an app for the first time. Some apps are from not-so-reputable developers. That’s why you usually want to know the name of the developer whenever someone points you to one of their favorite apps — because apps of the same or similar names can actually be quite different. Remove the battery. Do this if a program seems hung up. When my first Droid X got hung up and wouldn’t send or receive emails or phone calls, the first thing the folks at the Verizon store did was remove the battery. It got the program that was hung-up to stop. But it didn’t resolve the ultimate problem — which led to them giving me my second Droid X as a replacement. Dial *228 then choose option 2 to update your connection with Verizon’s cell towers. Do this if your phone suddenly starts dropping calls, if you’re only getting 1G coverage when others on Verizon phones around you are getting 3G, or if your phone seems to have difficulty finding your current location. Next up: my favorite Android apps for the Droid X!